INCHEON -- South Korea soccer coach Shin Tae-yong said Sunday that his side has a chance to reach the round of 16 at the 2018 FIFA World Cup despite the tough group draw. Shin returned home from Moscow after attending the draw ceremony for the 2018 World Cup in Russia. South Korea is part of Group F that is made up of the defending champions Germany; the North, Central and Caribbean qualifying winners Mexico; and Sweden, which beat Italy in the European qualifying playoffs to reach soccer’s showpiece event. 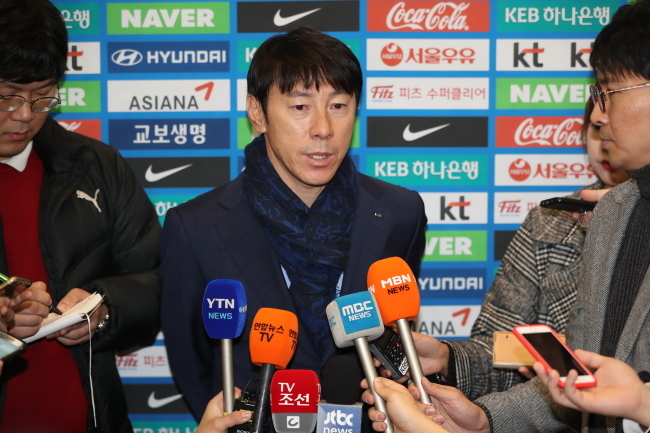 Shin reiterated that it isn’t the worst nor the best draw for South Korea, which will compete in their 10th World Cup. The 48-year-old admitted that it will be difficult to beat the four-time World Cup winner and current No. 1 Germany but said the men’s national team has a chance against Mexico and Sweden. The South Korean side remains winless against Sweden, with two draws and two losses. Both sides last squared off in 2005 in Seoul and played to a 2-2 draw. This will be the first time that the two teams will go head-to-head at the World Cup. South Korea holds a head-to-head record of four wins, two draws and six losses against Mexico. The Taeguk Warriors last met Mexico in a friendly match in 2014 and suffered a 4-0 loss. The two teams faced each other at the 1998 World Cup in France, where South Korea took a 3-1 defeat. The South Korean side collected one win and two losses against Germany. Both of the defeats were at the World Cup as South Korea fell 3-2 in 1994 and lost 1-0 in 2002. At the World Cup draw, South Korea was in Pot 4 based on their October FIFA rankings. Shin said he wanted to be in Group A that had hosts Russia, Uruguay and Egypt before teams from Pot 4 were drawn. Saudi Arabia later completed that group. Shin, who previously managed South Korea at the Olympics and at the FIFA U-20 World Cup, said the first match against Sweden is critical. South Korea will open their World Cup campaign against Sweden at Nizhny Novgorod Stadium in Nizhny Novgorod on June 18. It will then face Mexico at Rostov Arena in Rostov-on-Don on June 23 and take on Germany four days later at Kazan Arena in Kazan. Shin, who took over the team in July, said the national team’s base camp for the upcoming World Cup will be announced soon. He previously inspected candidate cities for a training base earlier. Shin was originally scheduled to return home Wednesday but decided to make an early comeback to prepare for the East Asian Football Confederation E-1 Championship against Japan, China and North Korea starting this week. After the regional tournament, Shin said his team will push harder for the World Cup preparations.